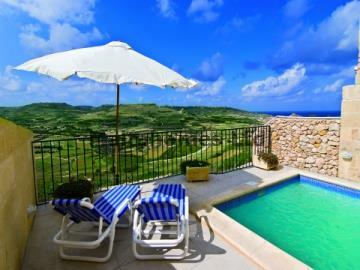 This cliff edge House of Character overlooks a valley and the picturesque fishing village of Marsalforn. It has been developed using various traditional features in stone to create a farmhouse effect. The property is set on three floors and includes a large combined kitchen/dining/living room, four double bedrooms all with en-suite facilities, a spare bathroom, a one car garage, a spacious games room and a private swimming pool with a good sized deck area. The main attractions of this property are the terraces situated on all floors enjoying breathtaking open views.